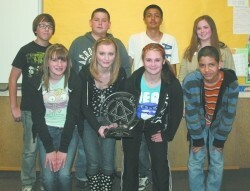 Nine local Jr. High students will be representing, not only Guymon, but the entire state of Oklahoma during an upcoming national competition. The 8th grade Academic team was invited to represent Oklahoma at the Inaugural National Middle School Academic Quiz Tournament in Chicago, after winning district, regional and state championships. Nationwide, 64 teams have been invited to participate, consisting of one team from each state plus 14 wild-card slots were filled. The Guymon team will be flying out of Amarillo on May 5. The tournament will be held May 6-8 at the Hyatt Regency Hotel in Chicago, where the team will also be staying. The tournament will be in a quiz bowel format, with the contestants buzzing in to answer. The 8th grade Academic team traveling to Chicago next week to compete in the nation tournament consists of Marco Veleta, Averie Hinchey, Seth Hale, Javier Najera, Brian Martinez, Deidre Harbinson, Joanna Whipple, Laci Ralstin and Priya Chetan.